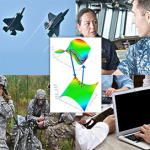 The Defense Advanced Research Projects Agency will hold a Proposers Day on Dec. 7 via webcast to provide information on a program that seeks to explore mathematical methods for use in the development of human-machine teaming systems in support of the military’s national security missions. DARPA said Monday the Agile Teams program aims to identify, test and demonstrate predictive algorithms, architectures and abstractions for the design of hybrid teams of humans and intelligent-machine platforms that will be evaluated through the use of experimental testbeds. “A-Teams is focused not on developing new AI technologies per se, but on developing a framework for optimizing the use of smart machines in various roles together with humans to ensure optimal human-machine teamwork for solving dynamic problems,” said John Paschkewitz, a program manager at DARPA. DARPA expects to apply results from the A-Teams program to software engineering, drug discovery, intelligence forecasting, logistics planning and other non-combat applications. The agency also plans to apply outputs from the program in the development of human-machine collaboration platforms through other DARPA initiatives, such as the Collaborative Operations in Denied Environment and Resilient Synchronized Planning and Assessment for the Contested Environment programs.